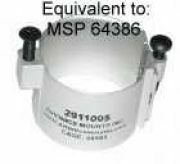 64386 equivalent mounting clamp. This clamp is a 1.250" round clamp, anodized per MIL-A-8625, type1, class2, with brass screws. This clamp is designed to meet the requirements of NASM28042, except for size.